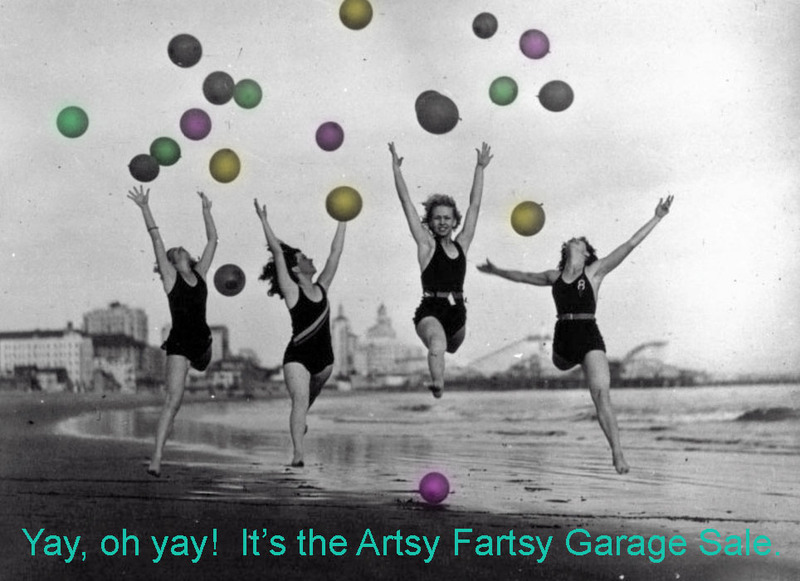 Okay, folks, it’s time for another garage sale! Clean out your studios, craft rooms, closets and wherever else you’re hoarding crafty supplies and make some money at the same time. On Tuesday, I’m going to go around my neighbourhood and put up flyers. If, by Monday evening, you know you’re participating for sure, would you send me a short list of what you’ll be selling? That way I can add the info to the flyers. If you can post even one flyer somewhere, that would be greatly appreciated. I can email you a copy. As well, quite a number of you have followers, blogs and websites, so don’t be afraid to let everybody know about this event. Just so I have an idea as to how many people will be setting up shop, do email me if you’re going to be selling. Any questions? Send ’em to rubydogart at shaw.ca. I have to tell about two books I just came across. First is ‘A World of Artist Journal Pages’ by Dawn Devries Sokol. Usually these books concentrate on U.S. artists, so any inclusion of Canadian artists is always a bonus. Almost half of this large book is dedicated to world wide artists and 16 pages are devoted to Canada. What really got me excited was seeing a spread from Penelope Harris’ journal. If you’ve ever attended the monthly ATC swap, you’ll know Penelope. 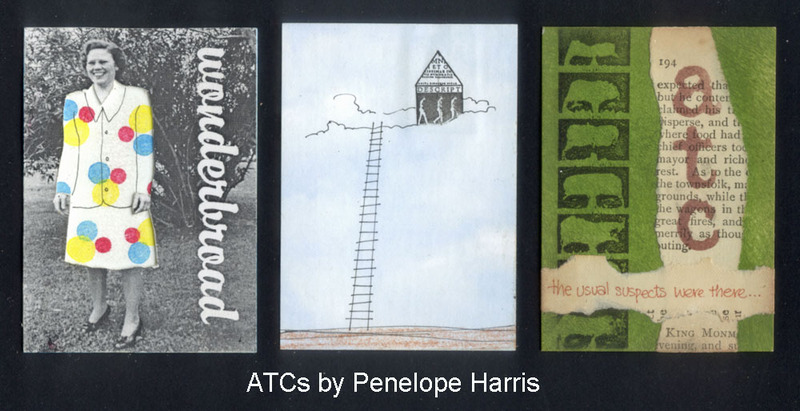 I love Penelope’s art and have a treasured collection of ATCs created by her. Sooooo happy to finally see her get some public recognition. The second book is ‘Map Art Lab’ by Jill Berry and Linden McNeilly. I loooove this book! 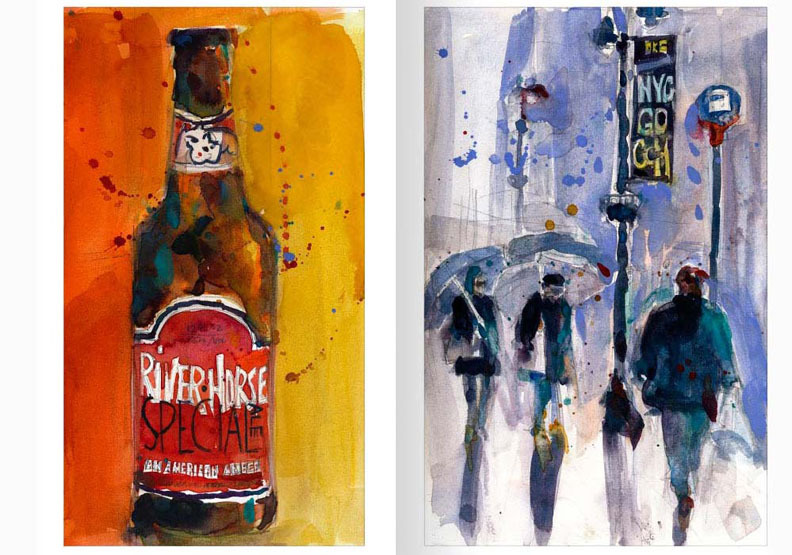 When you own upwards of 200 books on mixed media and collage it’s hard to get too excited about a new one; they all tend to look somewhat alike and feature the same artists. Even the aforementioned book, A World of Artist Journal Pages, doesn’t really show anything new; I was just so pleased to see my compatriots. Map Art got my creative juices flowing, though. Lots of really interesting ideas for making maps. I got both books from the library. You can do the same. Now, back to books. ‘A World of Artist Journal Pages’ features 230 artists and every one of them has a website or blog of some sort. So, you can imagine how much time can be spent perusing that many sites! I’m still working my way through the book, but below are some of the Canadian artists and a few others that caught my eye.